Our compact and portable Pocket-VR, which comes exclusively with CandyShell Grip, is a portable virtual reality viewer like no other. Now you can experience the amazing world of virtual reality, share the fun with friends and take it with you wherever you go. Pocket-VR is a breakthrough in virtual reality technology, an exciting development in a segment that is just beginning to emerge and change the shape of how we game, interact and learn. Like with all new devices, it’s always good to understand everything about them. Q. Why is Pocket-VR different from other VR viewers? A. Pocket-VR was created for ease and portability, with Speck’s quality and protection in mind. Pocket-VR is the only portable virtual reality viewer on the market that is collapsible, portable, and offers lens protection. It’s lightweight, requires no assembly, and is easy to share with friends! Q. How do I set it up/close Pocket-VR? • Insert your smartphone into the CandyShell Grip case. • Download and launch the free Google Cardboard app for Android or iOS from the g.co/cardboardapp. Follow the on-screen instructions and scan the QR code on the back of the portable VR viewer to pair your smartphone with Pocket-VR. • Slide the side panels of Pocket-VR outward until the lenses are revealed and the side panels rotate and spring inward. Insert both ends of your CandyShell Grip equipped smartphone into the open slots of Pocket-VR. • Look through the lenses of Pocket-VR to choose your content and jump into the amazing world of virtual reality. • When you’re finished, take your phone out of the viewer and slide it shut by holding onto each side and pulling the arms outward, then sliding them in. This way, the lenses will stay protected and you can take Pocket-VR with you wherever you go. Q. What device can be used with Pocket-VR? 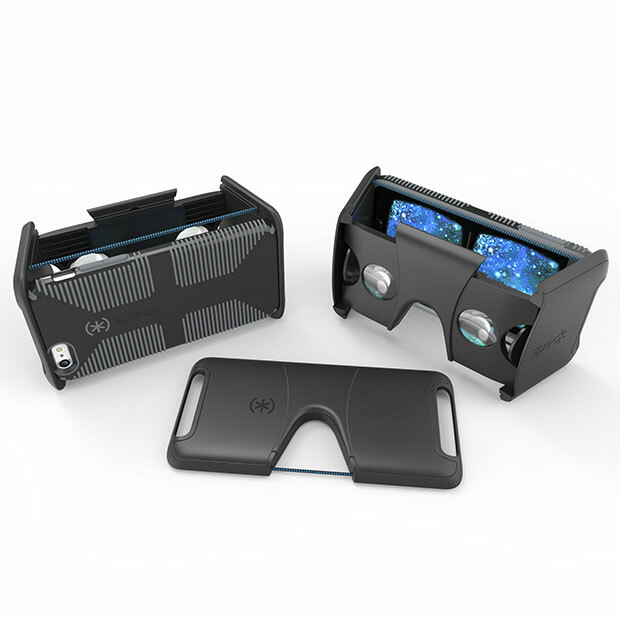 A. Pocket-VR is available as an iPhone 6s/6 and a Samsung Galaxy S7 portable virtual reality viewer. Q. Do any other smartphone cases fit with Pocket-VR? A: No, Pocket-VR is designed to fit with the CandyShell Grip case, which is included with this VR viewer. CandyShell Grip offers a non-slip grip and military grade drop protection, making it the perfect partner for Pocket-VR. Q. Do I need a smartphone case to use Pocket-VR? A: Yes, the viewer is designed to fit a CandyShell Grip equipped device. This way you can rest assured that your device will always be protected when using Pocket-VR. Q. What makes Pocket-VR’s construction so durable? A: Pocket-VR with CandyShell Grip is made from a compact, collapsible, hard plastic body. When folded flat, its completely self-contained form keeps lenses protected from dust and scratches. Throw in the military-grade drop tested CandyShell Grip with its secure, non-slip grip, and you’re ready for anything! Q. Is there anything about the construction or materials that stand out? A: We have used a special bungee that is designed to allow the retractable side panels to securely hold your device when open and in use. The bungee also keeps the panels tightly shut to shield the lenses from dust and scratches when it’s closed. Q. How do I clean Pocket-VR? A: Use a microfiber cloth to get rid of any build up on the lenses. To clean the inside panels of Pocket-VR, use a compressed air duster, similar to what you would use to clean a keyboard. Q. How much does Pocket-VR weigh? A: Pocket-VR is extremely lightweight. It weighs just 2.9 oz. and the CandyShell Grip weights 1.3 oz., making it extremely portable. Q. Does Pocket-VR come with a warranty? A: Pocket-VR is very durable and made to withstand everyday drops and knocks, so damage is unlikely. However Pocket-VR with CandyShell Grip is covered by our 1 year warranty. Contact customer service for more information. Q. Does it fit in a pocket? A: Pocket-VR is designed for the most popular smartphone devices, iPhone 6s/6 and Samsung Galaxy S7, and is similar in size. Pocket-VR will fit in most pants and jacket pockets. Q. Can I get a head strap for Pocket-VR? A: Pocket-VR with CandyShell Grip is designed for those who want to experience virtual reality content in shorter segments or while on the go. This makes a bulky head strap unnecessary. If you are looking for an iPhone 6s/6 or a Samsung Galaxy S7 portable virtual reality viewer with a difference look no further than Pocket-VR with CandyShell Grip! If you have any further questions, give us a shout.